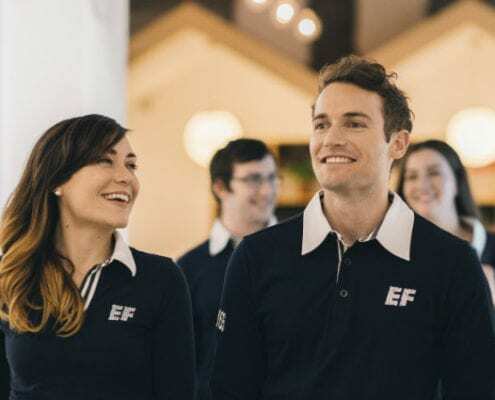 Teach English in China with EF English First! Why Teach with EF English First? Full suite of books and learning materials published by EF. Interactive whiteboard-driven multimedia lessons. Learners can interact with, touch, feel, hear, and see the language. Teaching Jobs in 60+ Cities! Earn up to 16,400RMB/month, sponsored visa, bonus schemes, flight allowance and more. Upfront paid flight for kids and teens teachers! Salary • Up to 16,400RMB/month! Teaching Young Learners: Teach small classes at EF First Centers for Kids and Teens. Teach students from ages three to 18 years old. Teaching Adults: Teach English face-to face lessons with a maximum of four students, workshop-style classes with up to 25 students, and “Life Club”-style English Conversation classes. Teaching Online: Online ESL courses offered from the Shanghai teaching facility. Online ESL teachers get the same benefits as adult ESL teachers. Native speaker from Canada, USA, UK, Ireland, South Africa, Australia, or New Zealand. The ability to obtain a clear background check.